Do you ever stop and think what things would’ve been like had you NOT done something that proved to be a pivotal moment in your life? What kind of alternate universe would you be living in today had you dropped out of school along the way? Who would you be with had a week before you met your significant other you met and asked out somebody else? What if you got cold feet right before you were to move away from your hometown and decided to stay there instead? Or what if you were pianist Sonny Thompson, recording as a sideman behind a stable of none-too-promising artists on tiny Miracle Records in late 1947, and when you got your chance to cut some sides on your own augmented by a group of fellow musicians known as The Sharps & The Flats, you declined because you had dinner reservations… or had to hurry home to listen to Fred Allen on the radio? What if instead of changing rock ‘n’ roll forever by releasing Long Gone, rock’s first two-part record with its sultry groove and some exemplary sax work that helped to cement that instrument as the most potent weapon in rock’s arsenal, you stuck to something a little more mundane? Well, if that was the case, you probably would’ve wound up releasing more songs like Sonny’s Return, a typical offering that WASN’T going to change the world or make you a star, leading to more than a decade of work as a musician, A&R man, arranger and producer… with a wife who was a star in her own right down the road or a lasting legacy for the many songs you had a hand in. In fact, what your life would’ve been like probably would be known only to you and your immediate friends and family, because it’s doubtful any of US would’ve heard about you. In the fall of 1947 rock music was still in the cradle, its short-term potential wasn’t even yet known, let alone any long-term potential to be the “new” musical genre of distinction. So session aces like Thompson were dutifully laying down whatever schmaltzy standards-inspired tunes that were being asked of them – primarily ballads – when backing hopeless singers such as Browley Guy in the studio, content to earn some pocket change to hit the town that night and have a few drinks and dig the scene. The band itself was shaping up to be Miracle Records most valuable employees however, not only for their work supporting their underwhelming roster of vocalists, but also because they were versatile enough to cut instrumentals on their own which could be used to supplement the label’s meager output. Thompson and company could play Art Tatum-like jazz, uptown blues or whatever this new noise called rock ‘n’ roll was shaping up to be. As the year wore down before the recording ban stopped them all in their tracks, Miracle had the foresight to call in Thompson’s crew seven times in December in an attempt to get as much usable material as possible safely in the can. Who knows if under normal circumstances they would’ve been afforded such an opportunity. But with that heavy session load the band needed to come up with songs suitable for any of the markets they might hope to reach and it wasn’t everyday that you had the inspiration to come up with something as otherworldly as Long Gone, and so you made due with something a bit more modest in its intent. Something like Sonny’s Return, a song that sounds as if the advances made on their prior recording sessions had never taken place, or else as if none of them thought those sides would make any kind of notable impact at all. The first thing that should stand out is who’s NOT here with them for this record. Anyone who’s dug the sounds Thompson laid down on Long Gone, particularly the hit Part Two side, was eager to hear more of the same on his follow-up release. They got that too, as tenor saxophonist Eddie Chamblee was featured on the A-side of this, Late Freight, but also got label credit in the process. Not so here, for Chamblee is nowhere in sight, as Sonny’s Return was cut at a session for which he wasn’t included – not surprising really, since nobody there had any idea as to the marketability of the sides he’d cut with them because none of them had been released yet. So they tackled other styled songs on Christmas Eve, first backing Guy again on more desultory material before the band got a chance to make the holiday merry by getting down to business themselves. Considering Chamblee’s importance to their sound which is largely responsible for their hits to follow, maybe he was really Santa Claus and was out delivering presents to OTHER rock ‘n’ rollers under their Christmas tree. Without him on board though the band reverts back to a different feel and to compensate for his absence they let the others handle more of the arrangement. This may be why Sonny’s Return is a very sparse song, almost more of a rough sketch than a finished performance. It features Arvin Garrett’s guitar up front which sounds okay, at least he gets off some decent licks, but without a fuller arrangement to compensate for the loss of the sax he’s awfully naked out there. Leroy Morrison’s stand-up bass is playing more fills than contributing a steady insistent bottom while Red Cooper’s drums are also not forceful enough. As a result there’s far too many gaps in the song to ever build a coherent melody for the listener to follow along to. What it sounds like is that moment on the bandstand when the group has been playing a tight full-bodied song and then they all step back to allow each of them a chance to take the spotlight themselves while the others contribute only the barest minimal accompaniment. In that setting it might work quite well, as the break in the louder refrains that would’ve preceded it would get you to focus more intently on what each one is doing individually. Though there are no virtuoso displays to draw your attention they all could play proficiently enough to work well within a larger framework, but when singled out like this none are strong enough to carry the song themselves. Even when Thompson’s piano takes the lead for much of the second half, an instrument that’s more suited to that featured role at this point in rock, it’s still not played with enough urgency to keep your full attention. He seems more intent on offering up occasional flourishes than in trying to establish anything resembling a sensible tune. Disconcerting in its emptiness like a skeleton shorn of its skin. The answer to the question posed at the beginning about what your life would be like had you not done something that proved monumental is answered loud and clear on Sonny’s Return. Thompson would’ve remained a club act, a session musician and an unknown. Capable of doing just enough to stay steadily employed but without nearly doing enough to become famous or in demand. This is also an example of the type of unambitious material that might’ve been striving – and failing – to fill the musical gap had rock ‘n’ roll not hit when it did. Deprived of the attitude that was such a key component of its appeal, this is rock of an alternate universe, re-imagined as a curious mixture of jazz and blues which above all else shows that not all things that work well on their own are intended to be mixed together. This is just such an uninspired combination. Sonny’s Return is merely background music for a club struggling to fill all its tables each night, destined to be taken over by new management with a new name adorning the sign overhanging the entrance, new jackets on the waiters and bartenders, a new MC to announce a new band playing for your listening pleasure. In the end someone DID have to replace them on the bandstand, not because they failed to connect with this type of song, but because the hit songs they HAD connected with made them too expensive, too popular, too GOOD for that type of small club any longer. Had they stuck to this lethargic mediocrity there’d have been no need for Sonny to return to do much more than pick up his severance check and pack up his equipment. Though there’d be another club where I’m sure they could find work for awhile longer along with another audience to try and reach, there would be diminishing returns each time out until they drifted into regular jobs and a boring life in the suburbs. Instead from now on the stages got bigger, the lights got brighter and the pay got better because it wasn’t THIS music they were playing anymore, it was the sounds of tomorrow, sounds which always are the bigger draw for an audience that rarely stands still and never looks back. 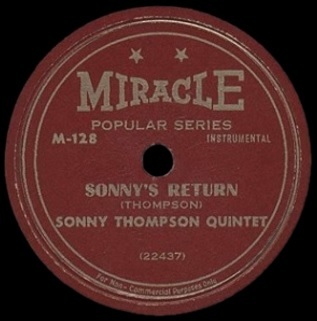 Leave a reply on "Sonny Thompson: “Sonny’s Return”"